The Shops at Mary Brickell Village is described as an urban oasis that is located right in the middle of Miami. This lifestyle center has become a trendy destination, bringing new and stylish retail outlets in the neighborhood of Brickell. Although this center doesn’t occupy a big space, it covers two blocks only, i.e., Miami Avenue’s 10th and 9th streets, it is a renowned center that is filled with people all day. Retail stores found in Mary Brickell Village offer that lovely Miami shopping vibe. You will come across highly sophisticated retail outlets which sell products that cater to the urban lifestyle. This center is not like the typical stuffy and congested shopping malls, it is an enjoyable place where you can slow down and take it easy. It is a place where you are allowed to be yourself and where you can enjoy the luxurious feeling that usually comes with living and shopping in downtown Miami. You can find everything here, designer clothing, shoes, handbags, and other accessories. There are also service providers and specialty retailers such as AT&T, Sprint, Blush, Spa and Nail Fever, Publix among many others. Whether you love fine dining or you are a casual foodie, there is something here to engage your taste buds. Are you in the mood for coffee, a full course meal, a glass of wine or you just want a quick grab? Well, at Mary Brickell Village, you will find a wide range of dining options. You can check in at Starbuck’s, Subway, Balans Restaurant and Bar, Burger and Beer Joint, Rosa Mexicano among others. This is where you can enjoy a sophisticated or fast-casual dining experience. 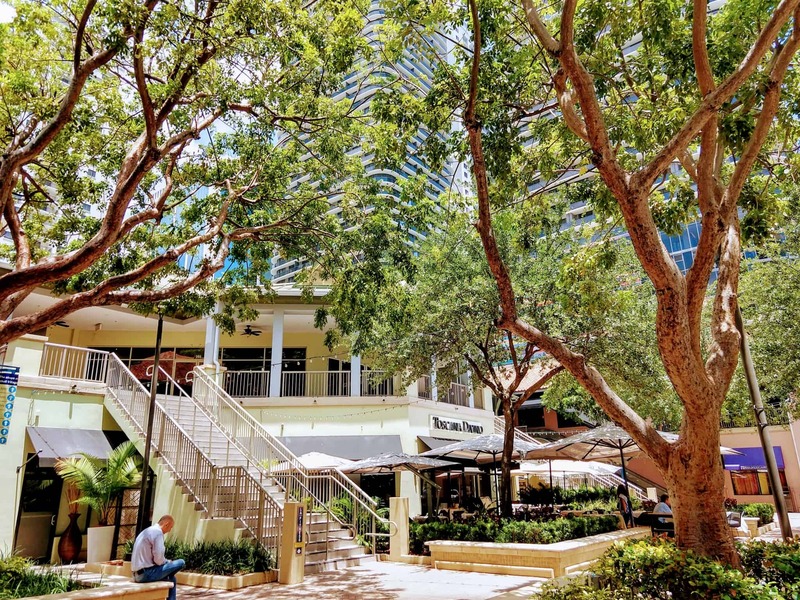 Mary Brickell Village is the favorite playground in Miami’s downtown. It is the hotspot of the Brickell life. The center offers a great place where you can come out to meet with friends for drinks, food, and parties. Since it’s only a stone throw away from the iFeeltech office, we often meet with clients for coffee here. Once in a while, the Mary Brickell Village will throw in something to the mix. Extra special events such as the Halloween, Super Bowl, St. Patrick’s Day, Cinco de Mayo, etc. usually are celebrated here. It is worth to note that shopping here is often accompanied by deals. You can enjoy deals from your favorite restaurants, service providers, and other retail outlets. They include happy hours, free-products and lunch specials. The Mary Brickell Village can be accessed by the Miami Metrorail found at the Brickell Station or Metromover. If you have your own vehicle, you can park it at the garage entrance which is located at the corner of 10th Street. There are also Valet-Parking services which can be found on the South Miami Avenue. Mary Village Brickell is open every day of the week.